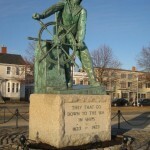 Commercial fishing in North America began in the early sixteenth century, and by the early 1600s English fishermen made their first expeditions into the Gulf of Maine. By the American Revolution, fisheries were the engine of economic growth and were driving the Northeast region’s prosperity. Groundfish fishing—or fishing for cod, haddock, pollock, flounders and other bottom-dwelling species—was the first commercial fishery. The dominant technology in the seventeenth century was the tried-and-true method of hand lines. Eventually, hand lining gave way to a technology called long lining around the mid-nineteenth century. At the same time, seine nets, which were in use since Colonial times became larger and more widely used. 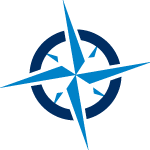 As time progressed, the industry continued to see significant advances in gear technology, electronic navigation, fish-finding tools, vessel power and efficiency. For centuries, groundfish stocks have served as sources that drive the economy and culture of New England, but there was no overarching legislation or management measure in place until the 1970s. The Magnuson Fisheries Conservation and Management Act (“MFCMA” or “Magnuson”) was first enacted into law by the United States Congress in 1976. Before the Magnuson was implemented, the fishery was managed through international and inter-state agreements. In 1977, groundfish stocks were managed under Magnuson beginning with the adoption of a groundfish plan jointly created by the National Marine Fisheries Service and the New England Fishery Management Council. Under this fishery management plan, new input and output controls were established and included catch quotas on cod, haddock (as bycatch only), and yellowtail flounder, gear restrictions, trip limits, and multiple spawning area closures. In 1982, this quota system was replaced with the Interim Groundfish Plan, which relied on minimum fish sizes, mesh-regulation and closed areas to control fishing mortality. Adopted in 1986, the Northeast Multispecies Fishery Management Plan replaced the interim plan and established biological targets to enable maximum spawning potential and continued to reply on gear restrictions and minim mesh sizes to control mortality. This management plan originally included fifteen species, but now includes nineteen stocks of twelve species: cod, haddock, pollock, redfish, ocean pout, white hake, witch flounder, winter flounder, windowpane flounder, yellowtail flounder, American plaice, and Atlantic halibut. 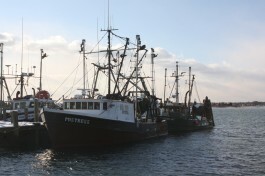 In May 2010, the New England groundfish fishery entered a new management regime, and a large percentage of the industry joined fishing cooperatives commonly referred to as “sectors.” Fishermen transitioned from a days-at-sea management system where permits were allotted a certain number of days they could fish and a certain total weight per species. Today, many fishermen are fishing as cooperatives (in sectors) and sharing both responsibility and liability for fishing under a hard total allowable catch (TAC). As an alternative to sectors, fishermen who chose not to join sectors remain in the “common pool,” where they are subject to effort controls under the DAS management system. Today, in the Northeast groundfish fishery, the primary gears utilized are bottom trawl, hook and line, and gillnet. Many fishermen who focus on the multispecies complex also participate in alternative fisheries including, but not limited to dogfish, shrimp, whiting, squid, tuna, lobster, scallops, monkfish and skates.